Surgical rejuvenation of the ageing face has evolved into one of the most frequently performed surgical procedures in Cosmetic Surgery /Aesthetic Plastic Surgery. Face lift Surgery , initially performed as a skin tightening procedure since the early part of the 20th century , has evolved a lot , thanks to the detailed knowledge of facial tissue anatomy , resulting in a better understanding of the facial anatomic changes that occur with ageing . Rhytidectomy / Face Lift surgery can be performed safely because facial soft tissue is arranged in a series of concentric layers .This concentric arrangement allows dissection within one anatomic plane, without disturbance of structures lying within another anatomic layer. Multiple techniques are available to improve the facial contour and excellent results can be obtainable through what appears to be extremely different surgical techniques , as facial soft tissues are mobile enough to allow manipulation through a variety of techniques , and it is the aesthetic destination that is important , rather than the surgical technique .Our goals while rejuvenating the face is, reverse as many signs of ageing as possible and do as little harm as possible in the process . Our preferred method is the two layered SMAS type face lift. In this along with skin envelop tightening; we use SMAS plication by suture imbrication, along the superficial surface of the SMAS. SMAS plication will produce an improvement in facial contouring as well as an improvement in facial shape. The incision is patterened around the ear. The temporal incision is placed within the hairline beginning at point immediately superior to the junction of the ear with the temporal skin (Although modifications in the procedure – like placing anterior hairline incision approaching temporal region , & other technical variations , may be needed depending on the patient concerned ). Also before skin undermining the age of the patient, the degree of degeneration of the facial skin, and the smoking history all must be taken into account. Immediate postoperative routine – The patient is provided with specific instructions about postoperative care. Dressings are not applied under Pressure. Head end of the Patient’s bed is kept elevated .Appropriate medications for preventing infections and pains is given. Sleep medications may be given. The patient can walk to the toilet with assistance on the first postoperative day and independently thereafter. The first dressing is done after one day to examine the suture line. 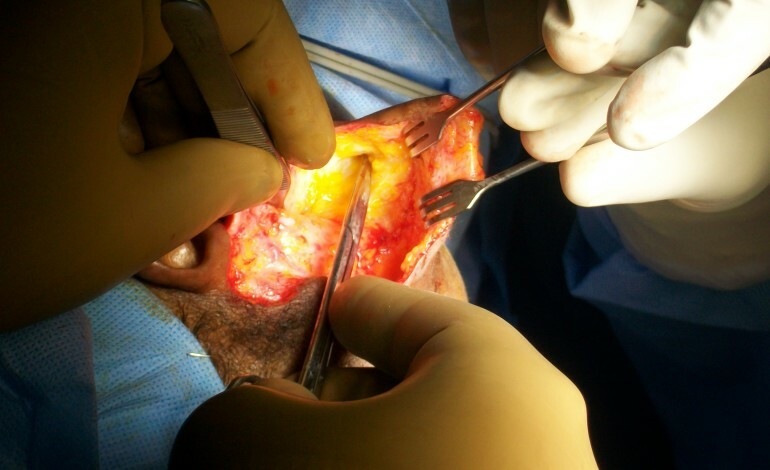 All stitches are removed by 8-10 post op day .During the first week, the patient is allowed to walk as much is reasonably possible. Strenous physical activities like –Going to the gym, playing Tennis, running is not permitted for six weeks .The patient is instructed to avoid all activities that hurt. The patient should be kept in follow up ideally for six weeks. Quality affecting the final results –The quality of the patient’s skin greatly influences the final outcome of the procedure. Patients with poor skin elasticity , severe sun damage , heavy facial rhytidids have a less satisfactory results , than people without these problems . There is no argument that smoking adversely affects wound healing, when skin flaps are undermined. It is likely that nicotine reduces arteriolar and capilary blood flow, which in combination with ischaemia produced by tension on an undermined skin flap can cause serious problems. But the facts remains, that a well designed and well executed face lift will have a profound effect on facial ageing changes in the upper face, mid-face, lower face and the neck and it is the mainstay of facial rejuvenation of all these areas.